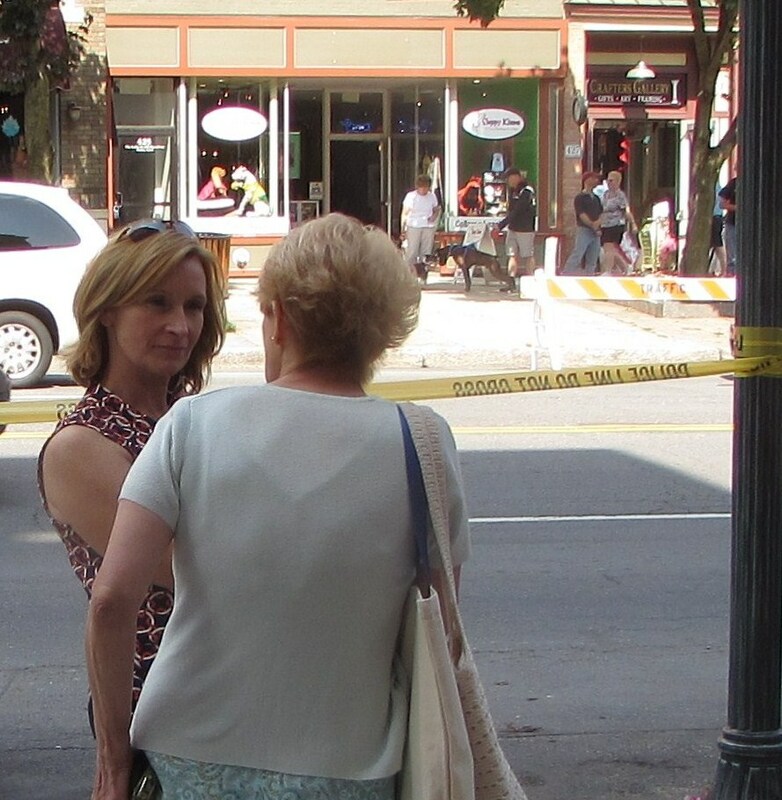 It was Tuesday morning, July 29, 2014, in Saratoga Springs. The sky was bright and clear, and the sun was warm and inviting. 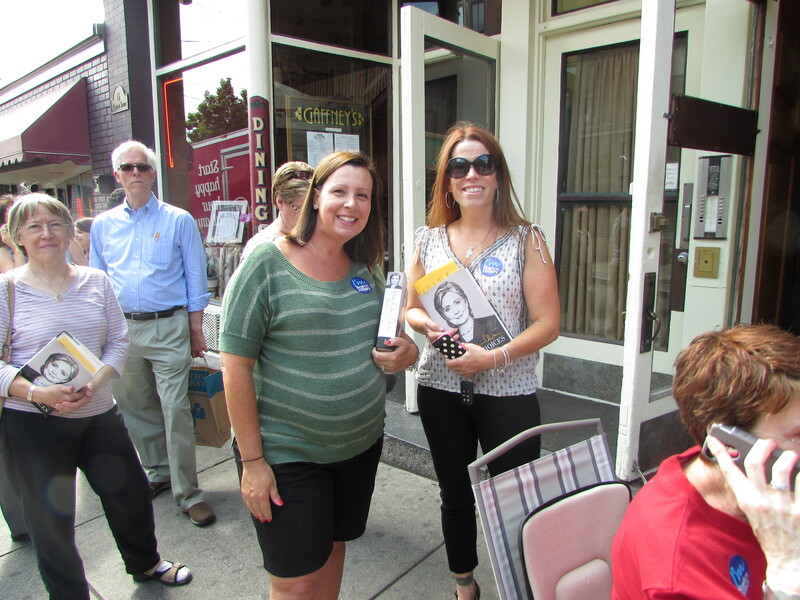 A cool breeze blew across Broadway and down Caroline Street, comforting the river of book-toting supporters during the four-hour wait to meet former Secretary of State Hillary Rodham Clinton. 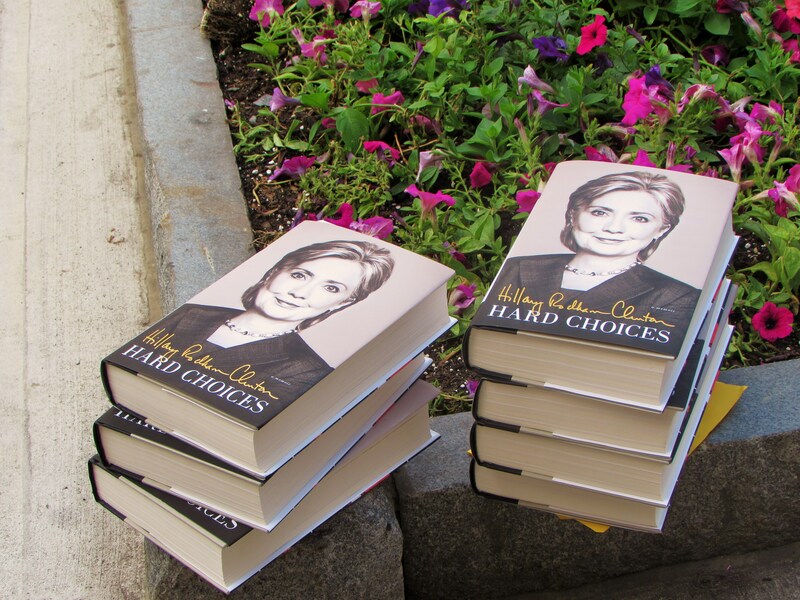 Folks of all ages patiently stood in line, chatting among themselves, hugging their prized copies of Hard Choices, and sparkling with anticipation. Nancy B.: I’m looking forward to reading her book, but I’m also here with my two young daughters, six and seven year olds. I think it’s important for them to meet the former First Lady and former Secretary of State, and potentially the first woman president of the United States. So I’m mainly here for them. 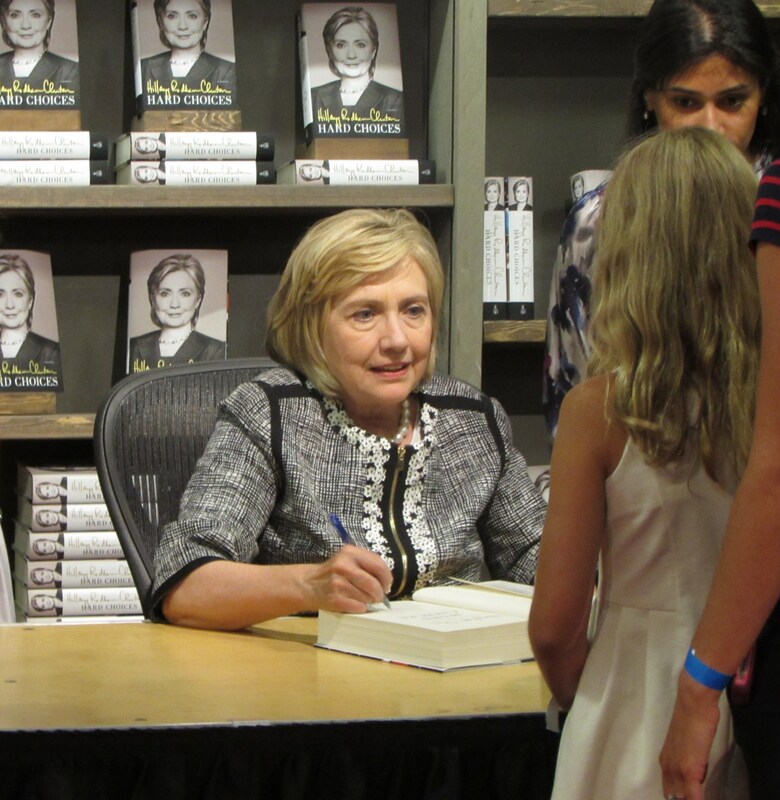 Hazel, 9 years old: Because I want to be president someday, so I thought it would be nice to meet Hillary Clinton. I’m reading her book, but I’m only two pages in. 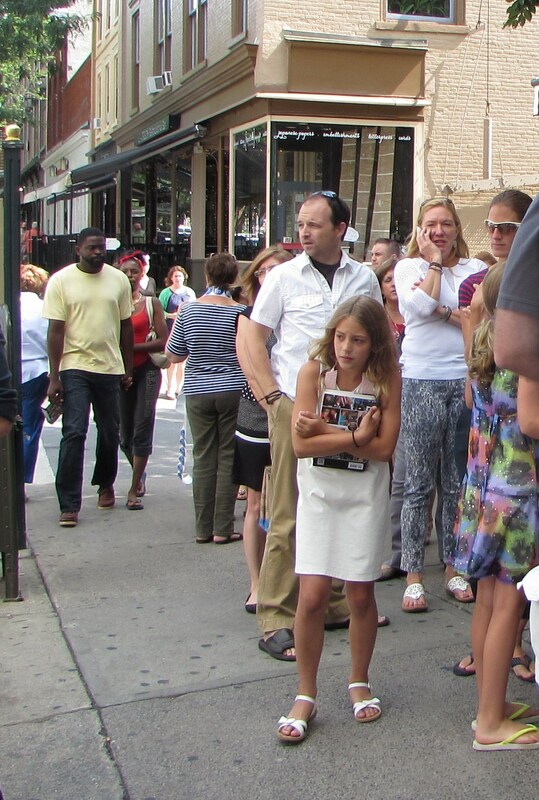 Sydney, 8 ½: I’m really inspired by her because I want to be president someday. I haven’t started to read her book yet because I just bought it yesterday. We’re going to read it tonight. I really hope she runs for president. Kathy: I want to meet our next president in person because I think she’s going to be the first female president of these United States. I back her 100% and I admire her. David R.: I want to meet her and I think she’s probably going to run for president. It would be cool to meet the person who could be the next president. 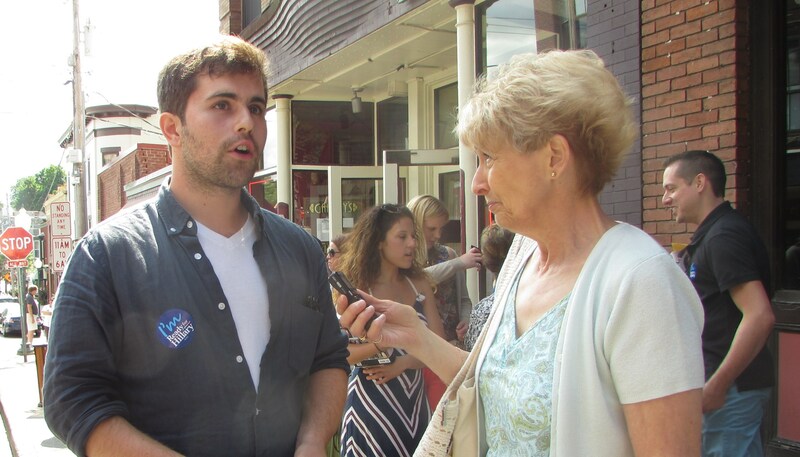 Sean England: I’m here as Communications Associate with “Ready for Hillary.” We’re a grassroots organization urging former Secretary Clinton to run for president in 2016. As of today we have about 2 ½ million supporters across the country. 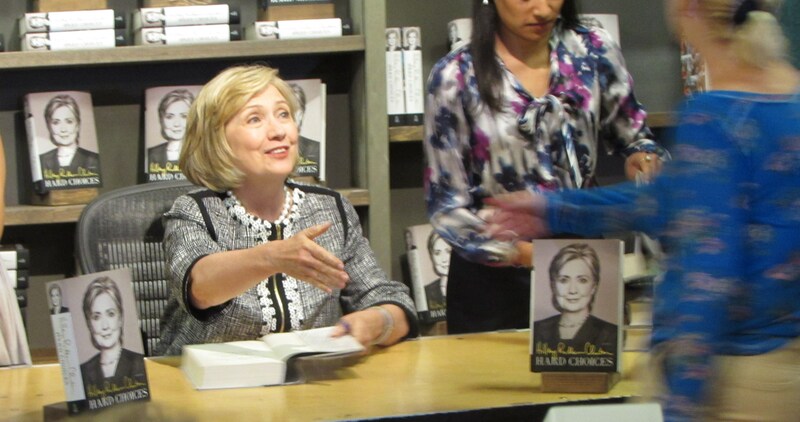 We’re following her book tour across the country, engaging with her supporters and trying to get people excited about 2016. I thought the book was great. It was really a powerful book. 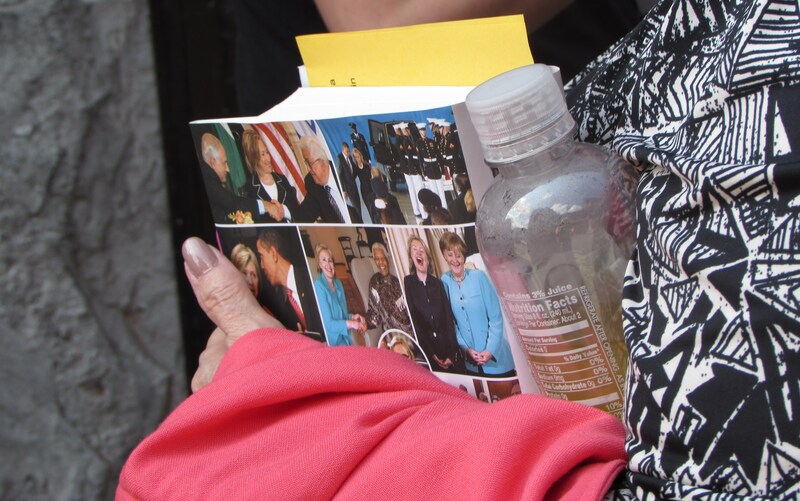 She identified a lot of key accomplishments that she made when she was Secretary of State. Debbie: I’m here because I had so much hope for the last election, and I feel that things are just so gridlocked right now. Sometimes I’m thinking that a woman’s touch—that collaborative relationship building and rapport building—that women do so well, might be what we need right now in our country. I’m hoping to learn about how she views world events, how she sees the global picture, how she sees our interconnection with other countries, and what her potential solutions are. I’m looking for her wisdom and experience. 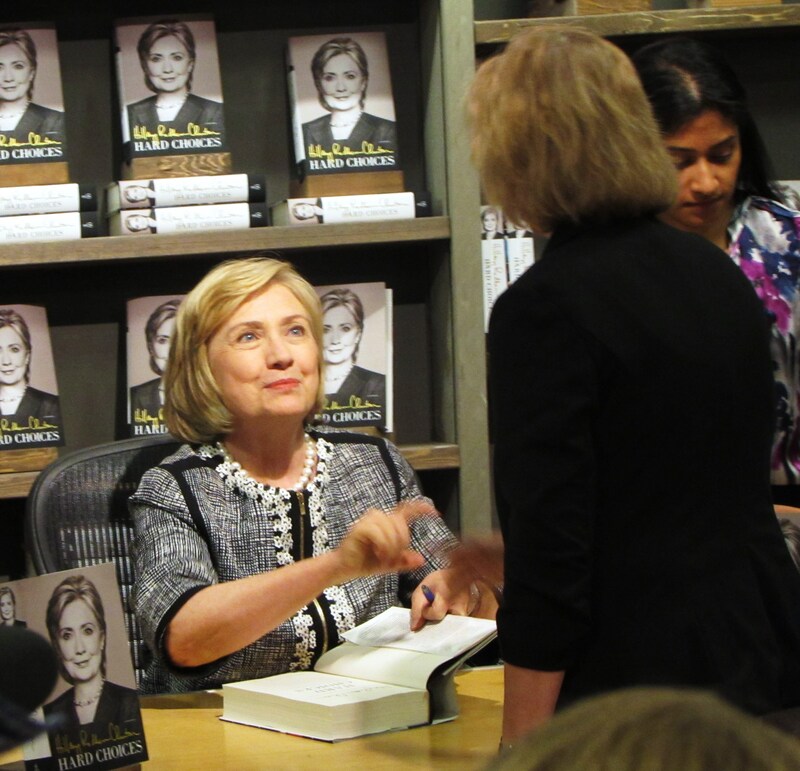 Nikki: I’d like to learn about Hillary’s perspective on the decisions she was involved in as Secretary of State: what variables were considered, how her own personal beliefs or values affected her decisions, and how she felt about the outcome. 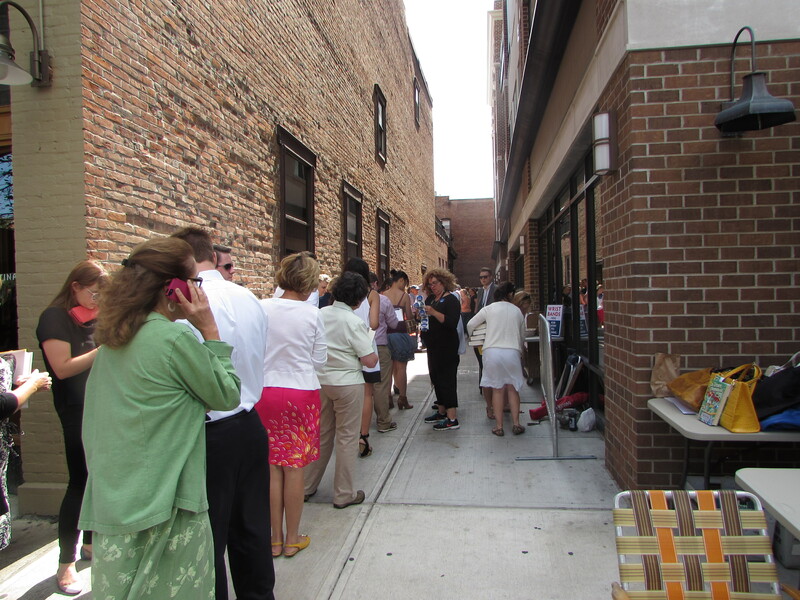 Our small, informal sampling suggests that there are numerous reasons why we purchase books and stand in line for hours waiting to meet an author. It seems clear, however, that this particular author drew Tuesday’s vast crowd for perhaps, more than just literary reasons. The Writers’ Loop extends our thanks and best wishes to those who graciously contributed to this survey. 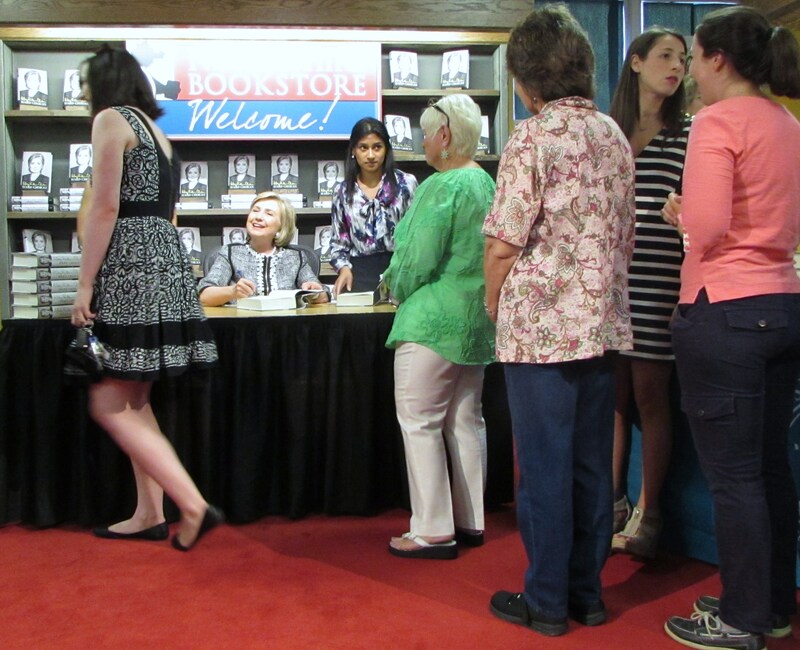 Categories: Uncategorized | Tags: author, book signing, book tour, Hard Choices, Hillary Clinton, Saratoga Springs | Permalink. This is Part Two of our recent interview with Jan Kardys. 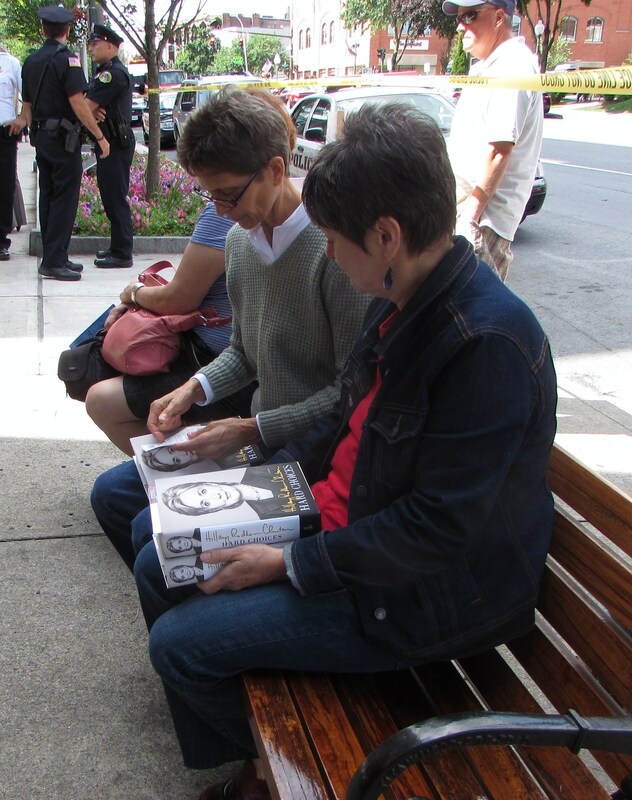 Peggy and I extend sincere thanks to Jan for her gracious interview, advice, information, resources, and for her generous gift of time in meeting with us. We also thank her for treating us to a lovely lunch! Besides good writing and voice, what are you looking for right now that you’re not getting? We should start at the beginning with query letters. Many people don’t know how to write a query letter. They might focus too much on themselves, and it’s not all about them… unless, for example, they’ve been published in magazines, or they want to tell how many blog followers they have for something they’ve written. For fiction, it’s more important to give us the whole story. The best way to put together a good query letter is to go on publisher’s websites, and look at how they do a summary of a book. It’s very finely crafted. Give us that information. I find a lot of writers are reluctant about telling us what’s at the end of their book. Well, I might need to know that, because a lot of stories are rehashes of everything else. We’re offended by spelling mistakes or by a letter that’s not organized, sort of a stream of consciousness. A query letter that’s say, three or more pages is too much. Get to the point. I usually give people the benefit of the doubt. I’m way behind on query letters. It’s just overwhelming. That’s why I only take on five or six clients a year, because as you can see, this has been a long journey. (She points to a client’s galley proof.) It’s taken over a year and a half for the author to get to this state stage. Now we’re in the beginning of the marketing stage. A lot of writers don’t understand how much work we have to do, back end, just to get an author to this level. So, the query letter is number one. Manuscripts come in with no page numbers or no title-slash-author’s name. There are certain things we need: page numbers, your name, and the title. As you can imagine, if we decided to print out thirty pages, we’d probably have a stack. If we lose track of one of the pages, without page numbers, we don’t know where the next page is… it’s extremely frustrating. That really bothers me because it means the author didn’t even look up the rules for formatting a book. I think writers should do a little bit of homework. Do you see a lot of that? Yes! I see a lot of it… tons of it, and I’m not the only one. My friends who are agents say the same thing. To me, it’s just common sense to put page numbers on a manuscript, but so many people just don’t do it. Can you talk a bit about platform and promotion? For fiction, it’s not just about social media, it’s about writing a lot of articles. Become known. Start networking with tons of writers in your genre. Read some of their books and write reviews, saying I’ll help you if you help me. You really have to network and try to do events. For example, if you write a novel, how many people are going to come to a library event? Probably not a lot, so what I would do… let’s say you’re promoting a children’s book that you traditionally or self-published. 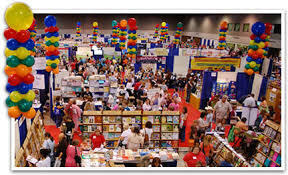 Get forty children’s book authors, traditional or self published, and make an event for the town. Get amusement rides, cotton candy, magicians… make it a huge event so that the whole town and towns nearby will write about it in their newspapers, and so that schools will know about it. 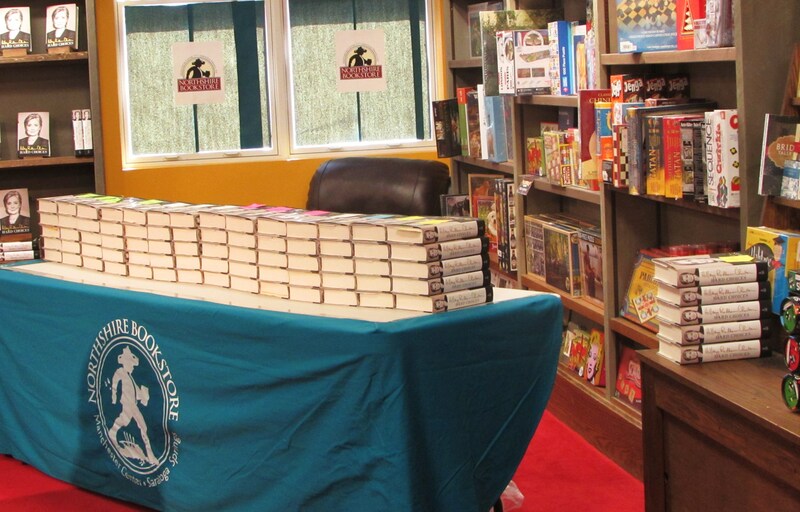 The children’s book authors can each have their own booth, and that’s the way to really sell books. The more people you get coming into these fun activities for kids, the more likely the parents will buy a book. You can’t just do it by yourself; you have to help each other. For non-fiction: Enhance your website. Put on the website really interesting things related to your content, so that it’s more than just about you and your book. Be THE source to go to for your subject,…so that your website is filled with, for example, good images, useful information, descriptions, relevant customs or history. You can write to bestselling authors in your genre and ask for quotes. But, the big authors can have contractual restrictions. Some publishers won’t allow their authors to give a quote to someone else in their genre, because those authors are in competition with each other. They might be allowed to give a quote to another author in that same publishing house. Publishers are very competitive. How does an author know when a manuscript is ready? If you rush your book and your manuscript is not in good shape, but you think it’s ready, you need to get about twenty-five beta readers to be brutally honest. That’s why I started the meet-up group. We needed writers to read and listen. They can be nice and diplomatic, but they have to tell the truth. There will be similarities, and if two readers say you need to improve your dialogue, then you’d better start listening. You can’t trust your family or friends because they’ve heard about your book so much, that the characters now live in their brains. You need someone who can be totally objective and who will use their gut feelings and instincts. First, get to the core with your manuscript. Don’t think that agents are going to give you direction, because they don’t have the time. The big agents get so much material, they don’t have time to waste. They want something special or different. They don’t want another vampire book. An agent advised against starting a novel with divorce. What’s your opinion? I wouldn’t start a book with divorce…you know why? It’s sort of a negative thing. Why not start it with a beautiful love scene or a scene where the two met when they were falling in love? Because if I know how much the character loved that person at one time, I will care about that character a lot more. If you suddenly start with a divorce and how the couple fall apart, and all their struggles….well, I want to see the good things, I want be hooked emotionally. It’s so important to hook us this way, and then you can go into the pain and suffering. A good novel has a rhythm to it, like a piece of music. There’s a conflict…it’s like watching a movie. When you watch a movie, you know something bad is going to happen, and then it does. And start looking at your book visually. That’s very important. It bothers me when I can’t distinguish between one character and another in a novel, because the author hasn’t distinguished their voices, and hasn’t given me visual descriptions of the differences between the characters. I need to see how they look. I need to see differences in dialogue. You need to weave it together. Please tell us about the 2015 Unicorn Writers’ Conference. 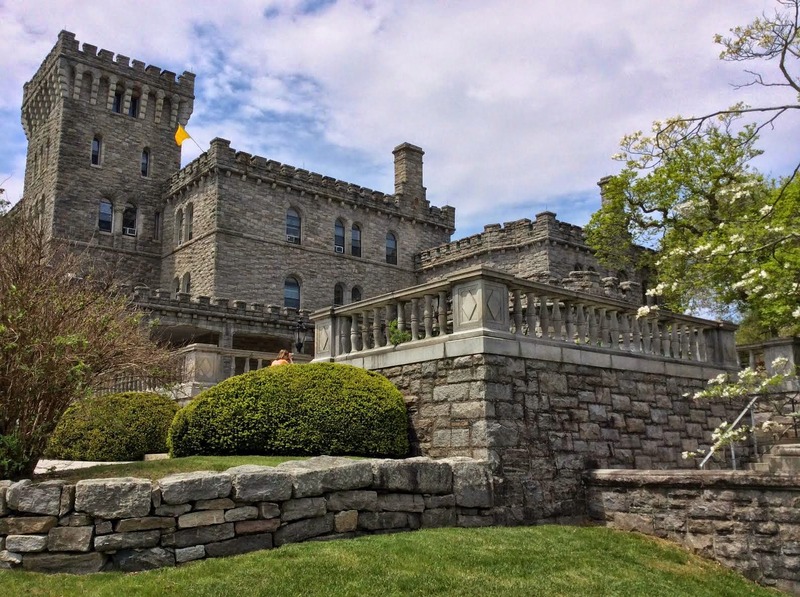 The next Unicorn for Writers’ Conference will be held from 7:30 A.M. to 8:00 P.M. on March 14, 2015, at Reid Castle in Manhattanville College, Purchase, NY. I’m already getting emails from agents asking to come. Some agents that have come in the past, have asked to come back. Other agents who we have not had in the past have asked to come. We have no problem in getting major agents. Our signature is the offering of our 1-1 manuscript review sessions for $55 for 40 pages to be read with comments by a literary agent and/or editor. You chose the agent or editor, register and provide the 40 pages, and then meet with them for 30 minutes during the conference. THANK YOU, JAN KARDYS, FROM The Writers’ Loop! Categories: Uncategorized | Tags: Jan Kardys, novels, publishing, The Unicorn Writers' Conference, writing | Permalink. Peggy and I recently had the opportunity to meet with Jan Kardys, president of Black Hawk Literary Agency in Redding, Connecticut, representing “a broad spectrum of authors and illustrators, with a focus on new nonfiction and fiction.” She is founder and chairman of the Unicorn Writers’ Conference, committed to educating and encouraging writers by providing connections with other writers, authors, editors, and literary agents; and by offering workshops, panel discussions, and opportunities for one-to-one manuscript review sessions with agents and editors. Jan and her business partner, Jeanne Rogers, recently established Unicorn for Writers LLC, also in Redding, offering a menu of forty expert publishing services for writers in various areas of manuscript evaluation and editing, publishing consultation and recommendations, social media and marketing, as well as cover design and illustrations. 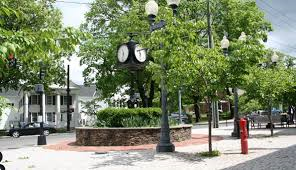 We settled down for lunch and a lively, informative interview in the distinctively New England town of Bethel, Connecticut. Jan started our conversation by displaying several of her current clients’ galley proofs (preliminary versions of publications) and her recent publication, You Wrote a Book, Now What? Jan exuded so much enthusiasm in discussing her career, her teaching, and her work with clients and writers, that she hardly touched her meal. I’ve been in publishing forever, and I worked for ten major publishers. Harcourt, Brace, Jovanovich was my first publisher. 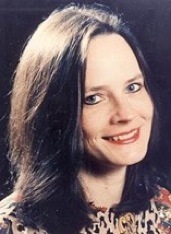 I started out in editorial, learned copy editing and proofreading, and took editorial classes at NYU. Later there was an opening to work for an art director and a production director. So I took a break from editing to learn this, because production is a key component for every single book. I worked for an incredible art director, and learned a great deal about art: how you choose an artist and how you negotiate with an artist, for illustrations, specifications. I learned about production runs and paper, and even though I didn’t want to stay in either of those two fields, it was invaluable, and helped me in many other areas of publishing. When Harcourt, Brace, Jovanovich moved to Florida, I took a job at Lippincott working for a subsidiary rights director. I did permissions, foreign rights, book clubs, ISBNs, catalog identification and publication, and all sorts of work for subsidiary rights. Lippincott merged with Crowell, and another merge was being planned with Harper and Row. So while taking a class at NYU from the St. Martin’s Press’ subsidiary rights director…I learned that they were looking for someone to do foreign rights. I brought my resume to the next class, got an interview, and I was hired. ….I also worked at Scholastic Inc., twice, three years in obtaining permissions, granting permissions, and doing some rights. 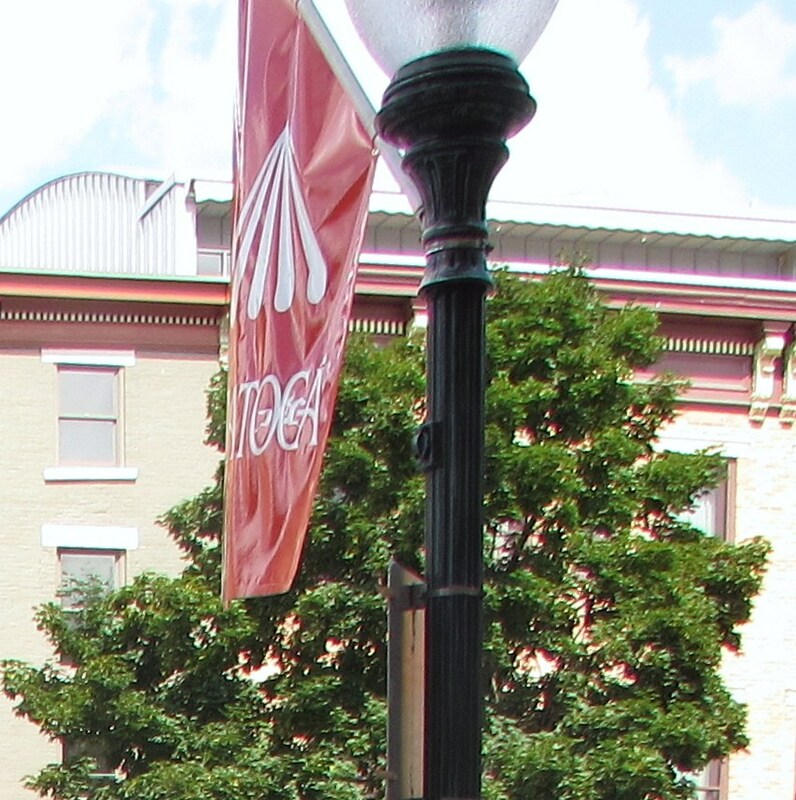 Then I went to Doubleday, where I switched from subsidiary rights into contracts. Doubleday was taken over by Bertelsmann, so I went to Macmillan’s contracts department. It was a great experience. I stayed there for 10 years and I would’ve stayed for the rest of my life, but once again, (she chuckled) every publisher that I’d been with had this happen… Macmillan was taken over by Simon and Schuster. I was promoted and did School/College contracts for a year. 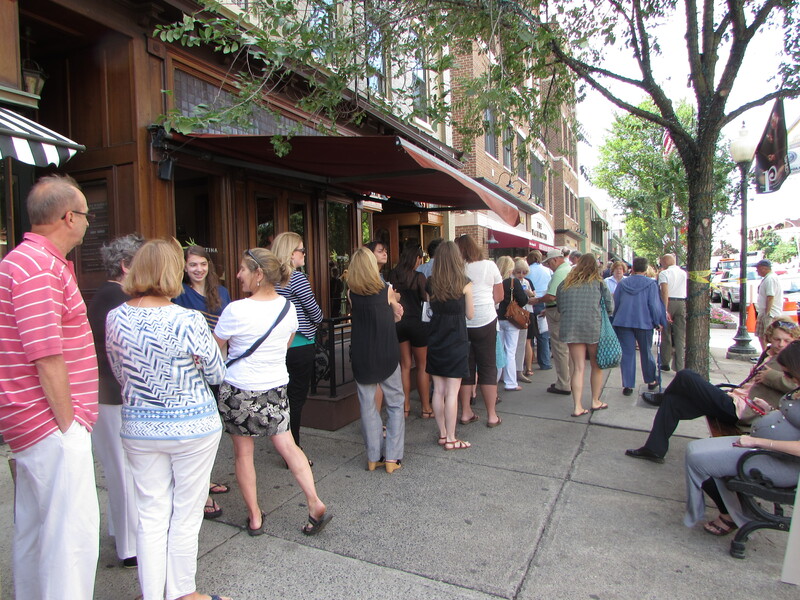 Then there was an opening at Warner Books, and I became a director of contracts there. Again, there was a merger. Warner Books and Little Brown dissolved into Time Warner Trade Publishing, and so I was there for four years. Then I went to magazine publishing only for a year. Once you’re a book person, it’s really hard to go into a different world, like the magazine world. So I left that and went to GOOGLE because I wanted to take a break since I had done so much in publishing, and I wanted to expand. I was head of contracts in New York GOOGLE… and took classes in marketing, advertising, and sales, and it was invaluable. I can’t begin to tell you how much I learned. Jan’s dedication to helping writers is unmistakable and seemingly unshakable. This is clearly visible in her work with writers: teaching classes in book publishing, creating and chairing the Unicorn Writers’ Conference, conducting writers’ Meet Up groups, providing library presentations on topics in publishing, and providing numerous resources on her blogs and websites. We started the company because the interesting thing today about agents is that we know what the future is going to be, we figured it out. There’s going to be more and more self-publishing. There are certain agents who on their websites say “consultation” or “marketing plans.” Agents should not charge a writer for reading their manuscript. That’s taboo. 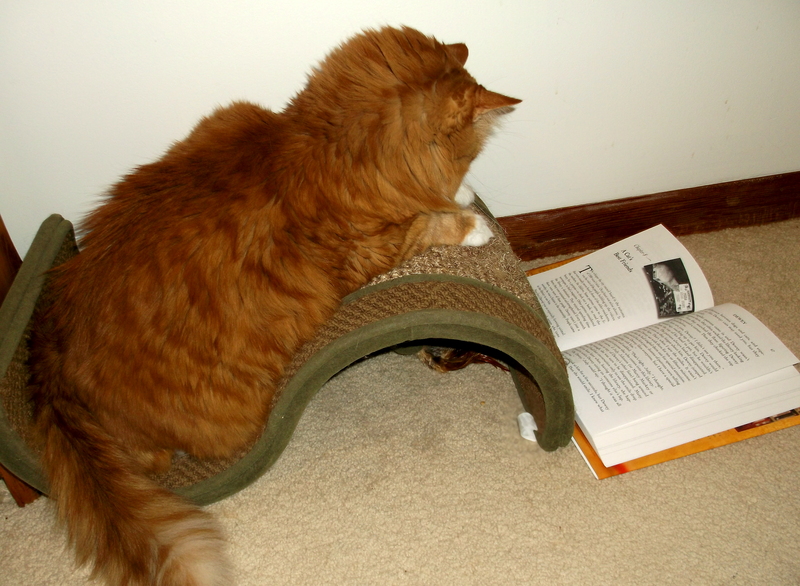 When I get queries, I look at five to ten to twenty pages, or sometimes I’ll read a little bit more. I usually know within the first five pages if the person can write. If they can’t write, I don’t have the time to help them. So I started the new, separate company. This came out of all the work that I have to do for my nonfiction clients. I was an English teacher…that was my first job and I love to teach. I just love to show people what they need to do, because to me it’s so easy because I’ve been doing it for so long. I’ve seen what works and what doesn’t work. The new company is called Unicorn for Writers. So it came out of what I know from teaching writing at Norwalk Community College, and Greenwich Continuing Ed, and others…teaching what writers need to know. What do you do first? Writers have to research their competition, and a lot of writers really don’t do that effectively. If you’re going to write a memoir, read a lot of memoirs, study what those writers have done. Study their writing style, take notes, and keep a journal. You’ll learn how they format their book, how they put it together. The whole Unicorn for Writers web site is designed for all the steps that a writer needs to take: first research the competition, then your manuscript – writing it, revising it, getting beta readers, doing a book summary, making sure the first five pages are incredible. Because if you don’t hook us, we’re not going to buy your book. The first page of the novel better be packed with emotion, and the main character has to ground us. 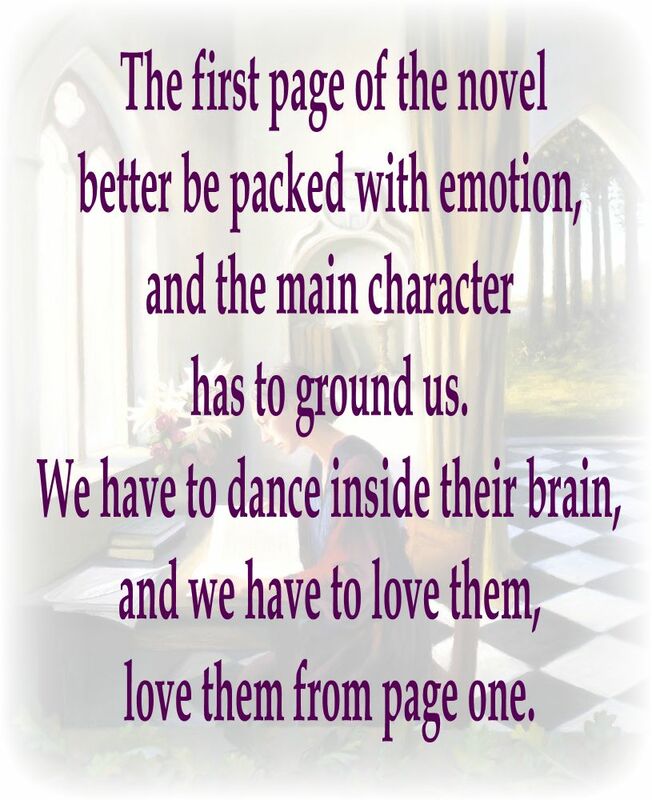 We have to dance inside their brain, and we have to love them, love them from page one. So that’s why we started Unicorn for Writers, and people have started to come to us. Jeannie and I do it together. 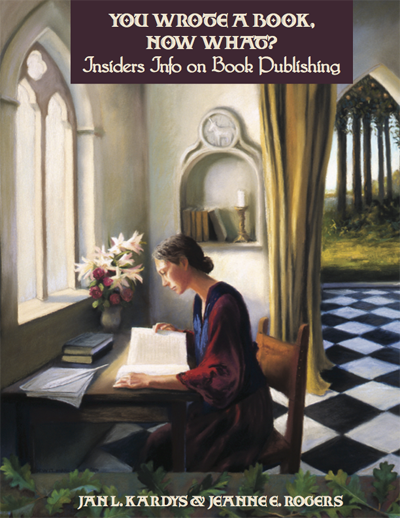 I talk about traditional publishing, and she talks about self-publishing. We sort of banter back and forth because there are tremendous advantages to traditional publishing, for example, distribution. Self-published authors can find book distributors, but they’re going to pay for those services. Jan discussed some of the services offered through the new company. Jeanne and I each read the whole manuscript, and then we write what we think of it. We do this separately and don’t tell each other what we thought until we’re both ready to send our emails to the author. The authors are really getting two evaluations for one. We do that deliberately because Jeannie will see things that I don’t see, and I’ll see things that she doesn’t see. We see emotional things for which we’re generally similar, like flaws in character or transitions, or the tone, or what whenever it is—the rhythm of the book. We seem to have the same kind of feelings, but we write it differently, which really gives the writer so much more. When we’re each ready to e-mail to the writer, then we talk about it. We find it really interesting what each has found, and what we liked or didn’t like. Then, there’s the cover—a cover design is so expensive, and you can pay one to two thousand dollars. You want a professional book design cover, because you don’t want a cover that doesn’t look good. I’ve seen so many self-published covers that just upset me, probably because I worked for an art director. I can see what’s good, and what doesn’t work. You don’t want to look like a self-published author when you’re on Amazon. So if you have a self-published cover, the public is not going to be impressed. I connected with probably two hundred artists and illustrators on LinkedIn to subcontract for us with authors who want a cover design. Unicorn for Writers is about connecting people. Writers have to be on TV, and on the radio, and have to be entertaining, so we also have a media trainer. He’s trained major politicians, and has trained three or four of our clients who love what he has done. Authors need to have that polish—the way you move, the opening line, how to hook the audience right away. Visit http://unicornforwriters.com/ for more information on services concerning subsidy rights, serial rights, foreign rights, book club rights, copyrights permissions, specialty and premium sales, and many more areas of publishing that might be unknown to most self-publishing authors. Please come back and visit on Sunday, July 27 when we will continue with Part II of this interview. We’ll cover Jan Kardys on topics including: good novel rhythm and visualizing a book; becoming a better writer; media ideas; publishing readiness; and advice on query letters, book summaries, and manuscript set up. We will also feature The Unicorn Writers’ Conference to be held on March 14, 2015, at Reid Castle-Manhattanville College, Purchase, NY. Categories: Uncategorized | Tags: Jan Kardys, Jeanne Rogers, novels, publishing, The Unicorn Writers' Conference, writing | Permalink. Author Paul Doiron strolled into the upper level of Northshire Bookstore in Saratoga Springs for his book reading and signing wearing a well-earned smile. 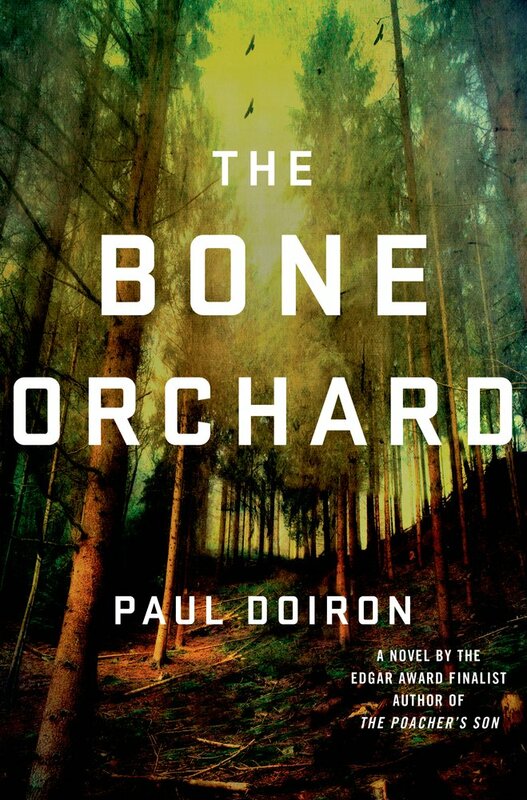 On July 15, St. Martin’s Press released, The Bone Orchard, the fifth title in his Mike Bowditch crime novel series, and he’s on a forty day book tour that will take him from his home state of Maine to North Carolina. His boyhood dream of becoming a career author has been realized. 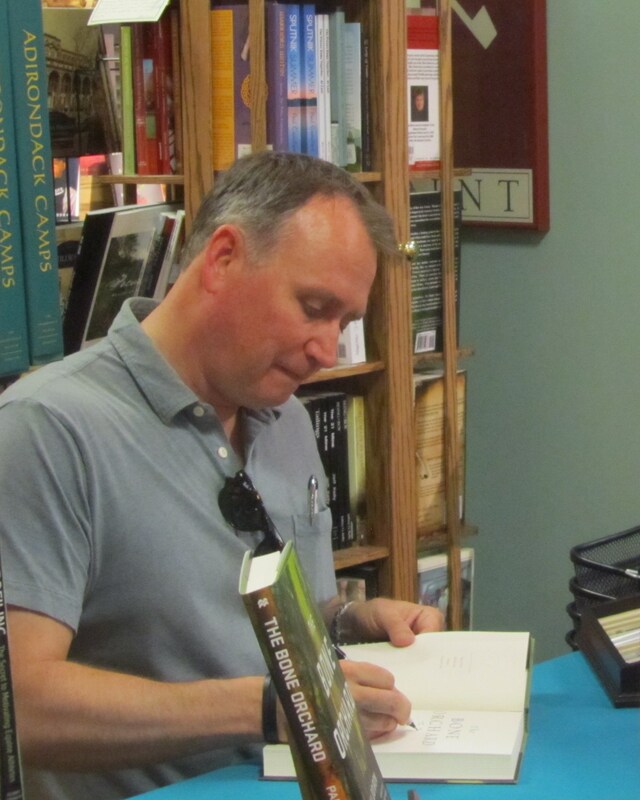 Paul Doiron signs copies of his new novel, “The Bone Orchard” at Northshire Bookstore, Saratoga Springs, NY. Although fiction, just about everything related to the Maine back country setting, natural environment, and crime issues in the Bowditch series is based on research. Paul is a Registered Maine Guide, which means that he is certified by the state in first aid, map and compass work, and basic woodcraft, to lead trips into the wilderness. “A lot of my research consisted of just spending time in the woods, talking with other guides and learning for example, how to call coyotes even though I’m not a coyote hunter myself.” The other type of research Paul delves into is, “shoe leather journalism.” He interviews game wardens, has an understanding of their institutional structure and culture, and knows how crimes are investigated in the state of Maine. In The Bone Orchard, Mike Bowditch has resigned from his position as game warden following a family tragedy and is working as a fishing guide in the North Woods. When his mentor, Sgt. Kathy Frost is forced to kill a troubled war veteran in an apparent case of “suicide by cop,” he begins having second thoughts about his decision. Paul relayed that he often brings reality-based issues like, “suicide by cop” into his fiction. In his second novel, Massacre Pond, he addresses Maine’s conflicting environmental and economic interests when Game Warden Bowditch is called to the scene of a bizarre crime. The corpses of seven moose have been found senselessly butchered on the estate of Elizabeth Morse, a wealthy animal rights activist who is buying up huge parcels of timberland to create a new national park. In his sixth novel in the series, which Paul is currently writing, he is addressing crime on the Appalachian Trail. Peggy: You’ve written five critically acclaimed novels in four years. How much time do you spend writing on most days? Paul: I can write as long as ten hours every day if I’m really in the zone. On other days I write for two hours, maybe two thousand words, and that’s great. A lot depends where I am with the story. If I’m still fumbling my way into a novel, trying to figure out what it’s about, who the characters are, it’s a very slow process for me. I end up throwing a lot of stuff out. There’s a point in every book, sometimes it comes earlier and sometimes it comes later, where I know it’s going to work. Once I’ve reached that point, it’s very fast. It has all settled in and I can just see it. Peggy: Do you ever find your own voice creeping into Mike Bowditch’s voice? Paul: I have, and not just with the dialogue. Because the story is told in his voice, I use certain words and not others. I deliberately make him an eloquent narrator, and he’s becoming more so as he gets older. He’s turning into a storyteller as opposed to someone who is recounting his own life. Peggy: How did you break into traditional publishing? Paul: It took me a long, long time. For years I was writing to get published. I was overly concerned about having a writing career. A number of years ago, I got a really good job and moved in with my girlfriend, who is now my wife. Suddenly, no more excuses. My life was very stable and I could write. At that point, I made the crucial decision to write for myself. I said, I’m going to write a book that I want to read; that I can’t find any place else. I did that for a long time. There came a point where I looked at it and said, this is pretty good. Then I had to be conscious of having to shape it to become something that would be readable to a bigger audience. Peggy: What did you do when your novel evolved into the story you wanted to publish? Paul: The key for me was getting a good agent. The best way to do that is to research writers who you respect and are doing something similar to you. Find out who their agents are because that is who will respond to whatever it is you’re doing. Finding an agent is a job. It doesn’t just come to you. It’s something you really have to pursue if you’re going to make writing your career and if your aspiration is to publish with one of the New York houses. Peggy: You have an M.F.A. from Emerson College. Do you feel this degree is necessary for a writer with career aspirations? Paul: No, it’s not vital. I resisted it for a long time. I wanted to be a self-made writer. Then I realized that some of the self-made writers that I emulated effectively had MFAs. For example, Ernest Hemingway studied with Gertrude Stein and Sherwood Anderson. Hemingway was taught in an informal setting. I do think MFAs can be useful. The difficulty is the degree doesn’t necessarily get you anything. What gets you something is working closely with other writers and coming to understand the craft really well. I always tell people who are going into an MFA program that there are going to be a lot of voices in your workshops. Tune out the ones that don’t understand what it is that you’re trying to do, but listen to the ones who do understand, especially when they’re critical. Overall, it was a good experience. I studied with some really good writers and it helped. It made me a better writer. Paul: (Laughs) More and more! I think people assume you publish a book, and you might give a handful of readings, and that’s it. These days, especially for a writer who’s looking for a bigger audience, there’s a lot of work that goes into it. Even before The Bone Orchard came out I was doing a lot of interviews, wrote on a lot of blogs, including Buzzfeed; a lot of social media. It’s to build-up anticipation about the book and then once it comes out, the tour. I’m bouncing around. Last night I was in Portland, Maine and today I’m in Saratoga. Tomorrow night I’m outside of Boston then I fly to Raleigh, North Carolina. I have twenty events in about forty days. Peggy: How does the tour help with publicity for the book? 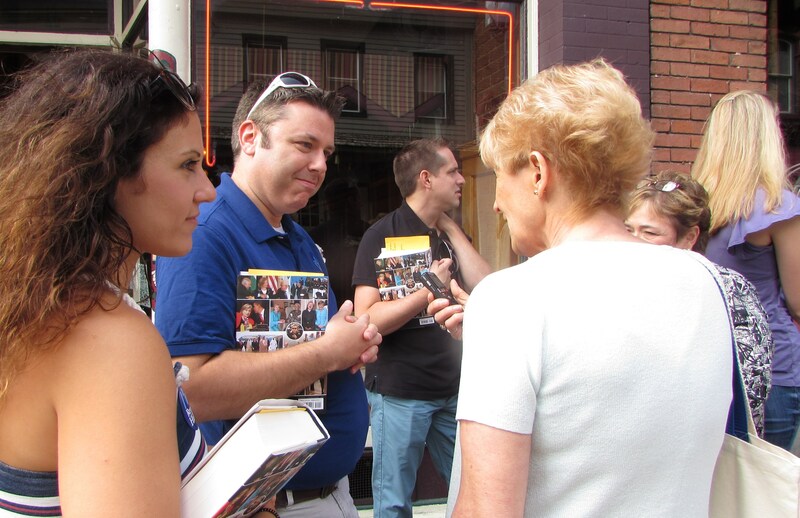 Paul : One of the reasons that you do tours is to meet the booksellers; to have your books in the media; to have signed stock in the bookstores so that people come in and see your books that are autographed and are curious about them. It’s a selling thing and it’s about meeting readers. 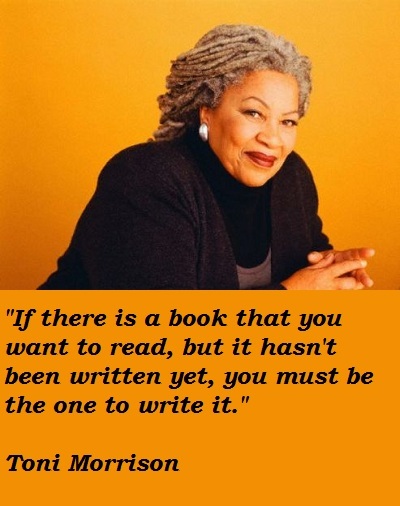 Peggy: What is your process for writing a novel? Paul: I write my first drafts quickly. I don’t labor over language. Occasionally, I’ll just get lucky with some passages and don’t want to change them later. I try to write those first drafts fast to have that sense of momentum; forward motion in the storytelling so I don’t get bogged down in description, and that sort of thing that I will add later. It’s hard for me to write the first draft because I know I’m writing poorly in places. I would never want to show it to anybody. There’s a side to me that says, I want to get the sentence right, but I know it’s more important that I just keep going. Peggy: What’s your advice for aspiring authors? Paul: Persevere. That’s really the key. I decided I wanted to be a novelist when I was thirteen years old, and I published my first novel when I was in my mid-forties. I wasn’t writing a novel all that time, but I was writing all the time. There was a period in my life, in my thirties, when I felt completely floored about it. Where I said, “Do I have the ability?” I had spent so much time in a room writing and typing . When I got an agent for The Poacher’s Son, it was great. When I got a publisher, I was stunned. Then I won all these awards. It was one of those overnight successes that took forever to arrive. If you really are serious, and you will figure out if you’re serious if you do persevere, something will happen. If you’re really not that interested, it’s a sign that you probably should do something else. 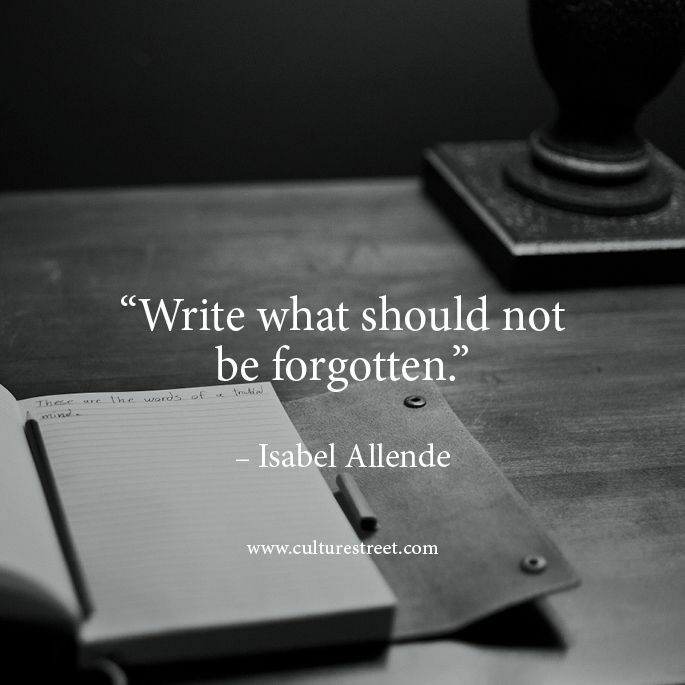 The great thing these days is you don’t have to abandon writing. You can decide to put your stories online and sell them digitally. There are many options for stories that aren’t destined to be published by the big New York publishers. And that’s fine. Get your work out there. Thank you Paul Doiron for your insight. We wish you continued success with your writing career! Categories: Writing | Tags: crime novels, Maine, mysteries, Paul Doiron | Permalink. I love most everything about writing novels. Creating vibrant characters, choosing fascinating settings, and developing intriguing plots are all part of the fun. The difficult part is not being able to easily display my handiwork, and let’s face it, when we create something, we like to share it. Actors want an audience, chefs want diners, and gardeners want admirers, but it’s not so easy for the novelist. A painter can invite friends over for dinner, point out her latest portrait hanging on the wall, and feel gratified by the compliments. An author can’t say, “I just completed 300 pages of my new book, have a seat, and read my manuscript.” Well, she could, but her guests would have to stick around for a few days, and they probably wouldn’t return. A novelist must be patient. Work hard, create the best story possible, and then publish it. Although it is difficult to break into traditional publishing today, there are so many options to get your story out there. 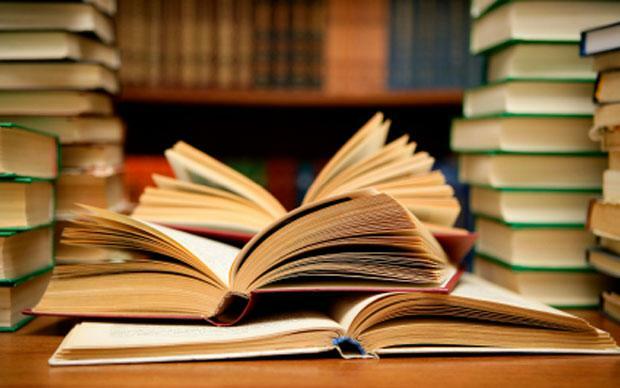 Self-publishing “done right” is currently highly respected in the book world. Review giants like Kirkus and Publisher’s Weekly have special categories on their website just for independent authors and literary agents are always on the lookout for writers who prove they can successfully market their books. There’s also the digital-only option for those who don’t want to invest the money involved in producing hard copies. I must admit, I do get a warm feeling inside when people tell me they “loved” my story. That it touched them in a special way. It’s like giving a gift to a friend and seeing a genuine smile when the package is opened. Negative critiques are okay too. Even Harry Potter didn’t find a place in everyone’s heart. The bottom line is, I told my story and it’s out there in the world for viewing. A few months ago, I purchased your book for my 95 year old great-great Aunt Dot who lives in Kentucky. 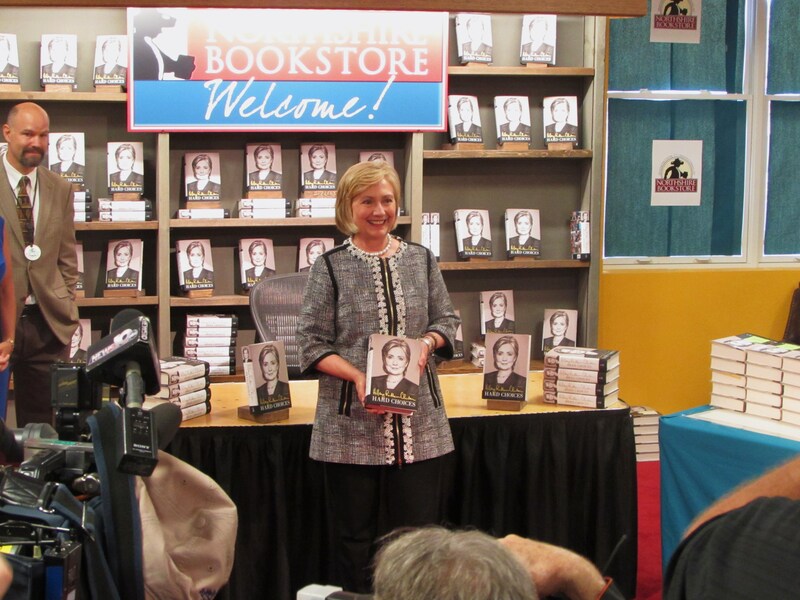 She has raved about your book and has since spoken with my grandmother about another book that you may have written. I see on your website that you will be publishing a short story via the Kindle, which she does not have and also another book. Would there be any way to get a hard copy of the short story? What about you? Is there something you’d like to create, but haven’t. What’s stopping you? 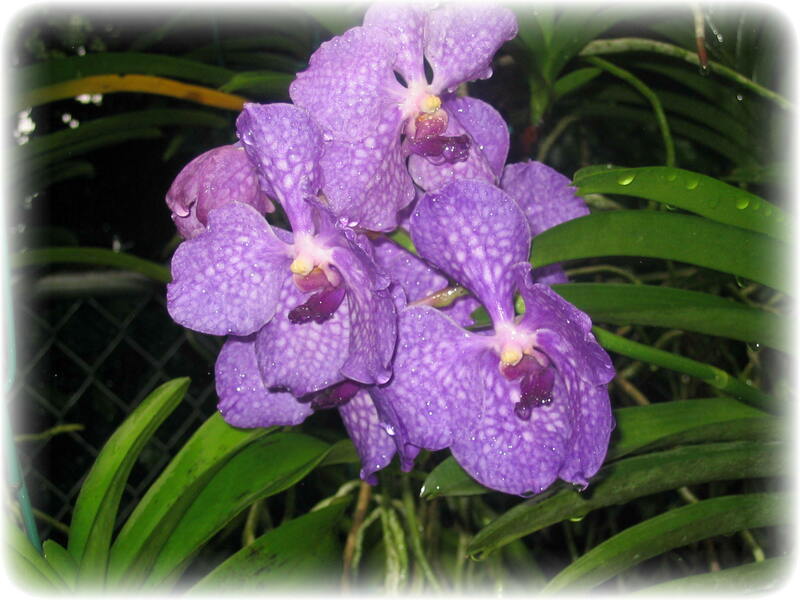 Categories: Writing | Tags: novels, writing | Permalink.